I recently rebuilt my PC and was annoyed by Skype for Business popping all of the newbie nag messages that I’d previously suppressed. “There has to be a way to suppress these en-masse” I say to myself. Whilst trawling through the Registry to find them it also occurred to me that when I’m delivering end-user training I actually *want* to see these nag messages. And thus, Set-SfBClientWarnings.ps1 was born. This script takes an option of “default” or “expert” on the commandline (with some aliases for the hell of it) and sets the values appropriately. Thankfully it wasn’t too hard to do in PowerShell: any time you check “Don’t show this again” one of these messages pops, SfB just adds a new DWord Property to the \DS\ container in the Registry. A vanilla install of SfB doesn’t even *have* this DS container, so deleting it is a quick and easy way to return the client to the default warning levels. Setting expert-mode is simply a matter of creating the container (if it’s not there already – like in Gilligan’s profile above), and adding the properties set to a “1”. Click “X” to close an established audio call. Click “X” to close an established video call. Sign out of (or close!) 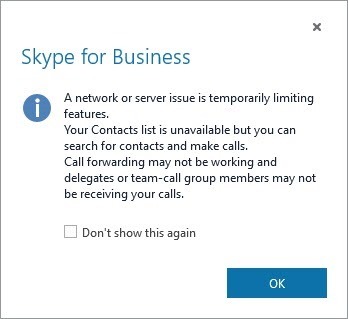 Lync while a call or IM is established. Click to show either your Primary or Secondary monitor. (This key is reused for multiple Sharing scenarios). Click to show “All Monitors”. Click to share a specific program. You’re sharing and click Give Control / Give Control Automatically. You’re sharing and click Give Control / <Specific Participant>. Leave a meeting you’re hosting. Right-click a contact and change their Privacy Relationship to Blocked. Right-click a contact and change their Privacy Relationship from Blocked to something else. Right-click someone to “Tag for Status Change Alerts”. This will pop if they’re not already in your Contact list. Park a call, then close the conversation window. 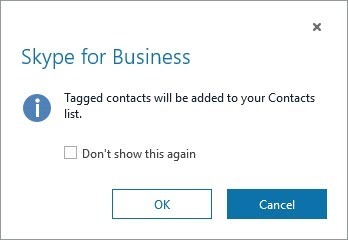 Edit a phone number in your personal contacts, or check/uncheck “Include in my contact card”. Add or remove a member from your Team Call Group. (This key is shared for both Team Call and Delegates). Add or remove a member from your list of Delegates. (This key is shared for both Delegates and Team Call). Office 2013: Click the Camera icon and select “End Video”. This is another I don’t know the trigger for. Any ideas?? You’re in “Limited Functionality” mode. Edit your Personal Note when it’s showing your (active) OOF from Outlook. Press the red “Hangup” button to end an RGS call. (The top-right “X” won’t trigger this message). There are two I’ve catered for with special handling. I decided that including the E.911 message by default probably isn’t such a wise move, and some users (like moi!) might want to be prompted if they’re accidentally about to close all conversation windows and not just one. Close the conversation window with “Tabbed Conversations” checked & multiple IMs active. This will pop if you click “X” to dismiss the “Set Your Location” prompt. v2.0 12th March 2017. Renamed from “Set-Lync2013ClientWarnings.ps1” to “Set-SfBClientWarnings.ps1”, added “DSFTAndOthersClose”. Updated blog imagery to all SfB captures. v1.4 4th October 2015. 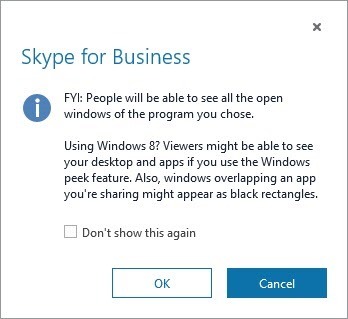 Added some more registry keys & support for the Office 2016 SfB client. v1.3 14th February 2015. Added some new registry keys, added optional switches for the ‘special ones’ and reformatted the blog post. v1.2 10th May2014. Added new registry keys for Blocking, Unblocking, Tagging a contact, and for when you close a parked call window. (I’ve added these images to the blog post). v1.1 29th Apr2014. Ståle Hansen kindly found a flaw in my logic: sometimes the key is created and set to 0, which v1.0 did not cater for. All sorted. Thanks Ståle! v1.0 18th April 2014. Initial release. If you find any more keys in your DS container, please capture the “don’t show” box for me and send the key name, and in return I’ll add them to the script. HI there! 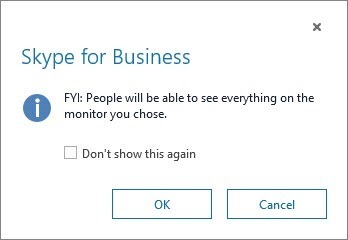 thanks for the post however i have a slightly different popup that isn’t obeying the “Don’t show this again” tick box. 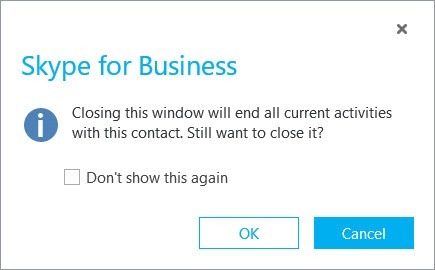 We have phone integration (cisco) with Lync, and i have a user that when on a call tries to close the Lync call windows and a box appears that states “Do you want to end the call when you close this window? If you answer No, the window will close, but the call will continue on your audio device” and whether the user chooses YES or NO, the box still pops up every time. Was wondering if you might know of a fix for this or if one of your keys above would suppress this. sorry forgot to share a pic of the “do not show” box. I can’t say I’ve heard of that problem before. I’m wondering if that’s “DSCLOSEPBX”, my mystery key? Does it exist in your Registry at the “/DS/” location I identify in the script and show in the second image up the top of the post? If it’s *not* there (or is but set to a 0), does your experience change if you add the key and set it to a 1? (The script should do this anyway if you run it in “-expert” mode). Are there any other keys in that /DS/ location set to a 0? Try setting them in turn to a 1 to see if that suppresses it for you. What about blocking the conversation popup (meaning the icon with the persons picture, if it’s there, and the first line of their message?) This is something that goes back years for Lync and now Skype for Business. 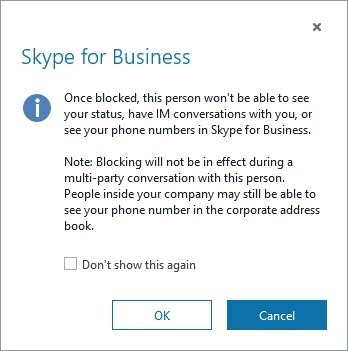 Their recommendation is to set your status to Do Not Disturb, but it would be better to be Available and not have that annoying popup on your screen when someone pings you. (1) Selecting the “Don’t show this again” box, and then clicking Yes to close the confirm dialog while ending the call, will set DSCLOSEPBX to 1 and result in the call always ending when the Lync window is closed – not the behavior I desire. 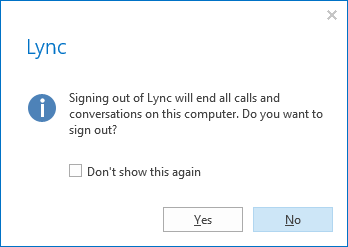 (2) Selecting the “Don’t show” box, and then clicking No to close the dialog while keeping the call, will set DSBRANCHOFFICEWARNING to 1 but the confirm dialog still shows when closing the Lync window. (3) I also tried creating DSMultiModeClose and setting it to 1, but that didn’t help. DSCLOSEPBX -> is seen when user is RCC enabled and is trying to end the call ! Thanks Pragathi. I’ve added your update to the post and it will also go in the new version I’m working on, out tonight or tomorrow. This might be solved a different place but I try my question anyhow. When you click on a tel: configured phone number in a web page you get the click to call popup. Do you know if it is possible to disable this popup so the call is set up directly when you click the number instead of getting the annoying popup? Can’t say I have Jan, sorry.